We’re bringing the bush and stream into our home by incorporating as many windows and doors as possible. The very essence of our design is about incorporating the natural environment into our home. One of the most appealing aspects of our section are the native trees that envelop the rear of the site. You can sit amongst the bush and hear nothing but the wind through the foliage and a chorus of birdsong, making it impossible to believe that Suburban Auckland is just a few hundred metres away. Our exterior design forms a bunker-like appearance from the drive to provide us with privacy, while it’s the complete opposite once inside where many of the walls are virtually transparent to create the illusion of living in the bush. It’s a key feature to our design, where only the best will do. That’s why we’ve asked Fletcher Window & Door Systems to bring our ambitious vision to life. 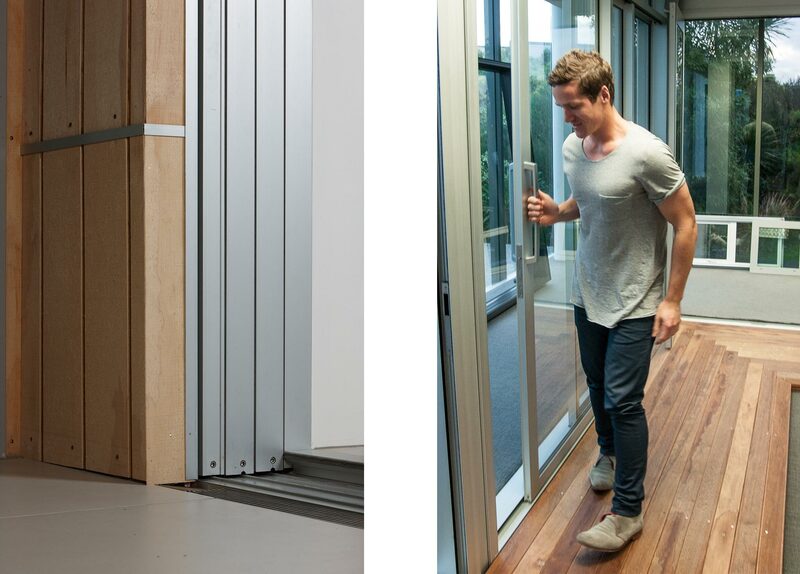 Ben worked with Fletcher Window + Door Systems on The Block and loved their products, in particular this giant Eurostacker Door, enabling the entire wall to just slide away. A feature we’re adding to the rear of our living area, providing uninterrupted access to the bush. The Level Step Sill gives a perfectly flush transition to the bush. We hope to pull off some big ideas that will make a lot of our house feel transparent, creating the illusion of actually living in the bush. And that comes down entirely to the windows and doors Fletchers are going to make and install for us. We’ve decided to use the Atlantic Suite because of its great looks and high performance. Throughout the house we’re using full scale, floor-to-ceiling windows to showcase our bush and stream surroundings. At the rear of our living area we’re installing a giant, full-height Eurostacker, meaning we’ll be able to slide the entire wall away into a cavity. Then combined with Fletchers’ brand new LevelStep Sill (pictured to the left), we’re going to be able to achieve a perfectly flush transition into the bush. Mmmm. Over in our master bedroom we’re almost fully enclosed in glass so we can lie in bed amongst the trees and watch the birds fly by. While in the ensuite, we want to feel like we’re showering outside, so we’re constructing a full height window at the end of the shower. Lucky it’s a super private section. Then of course there’s our centrepiece, the glass bridge over the stream. We deliberated for ages on the colour of glass to use, conscious that we wanted a natural aesthetic that didn’t make our outlook unnecessary dark. We eventually settled on a clear option, but like most people, we initially assumed all double glazing is equal. But that couldn’t be further from the truth as double glazing varies greatly in its thermal efficiency. With over a quarter of a home’s warmth escaping through its windows and doors, it’s actually the glass that is the most important element in optimising the energy efficiency of these openings. 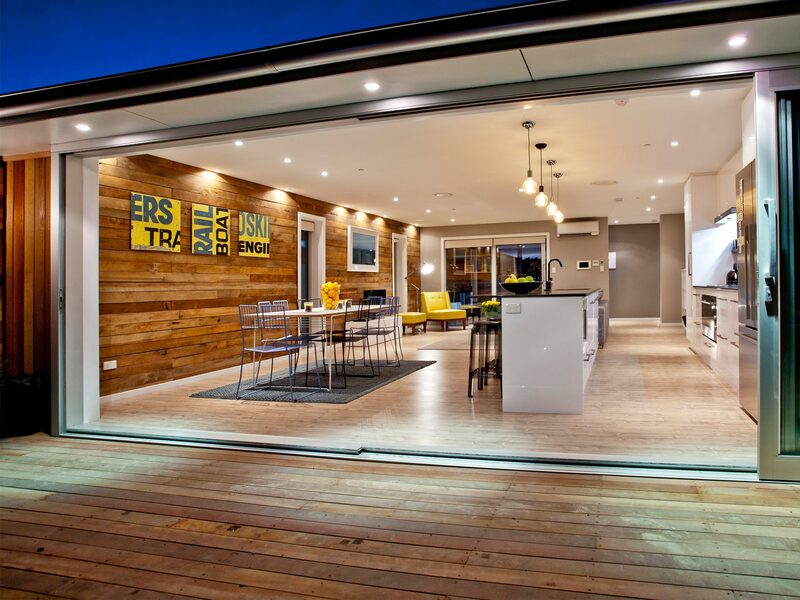 We certainly picked up our ears when we were told this information, realising we could loose all of the energy efficiency we’re creating by building our house with Structural Insulated Panels (SIPs), if we didn’t choose the right glass option. The Fletcher Team’s recommendation? Viridian Glass’ Planitherm technology. 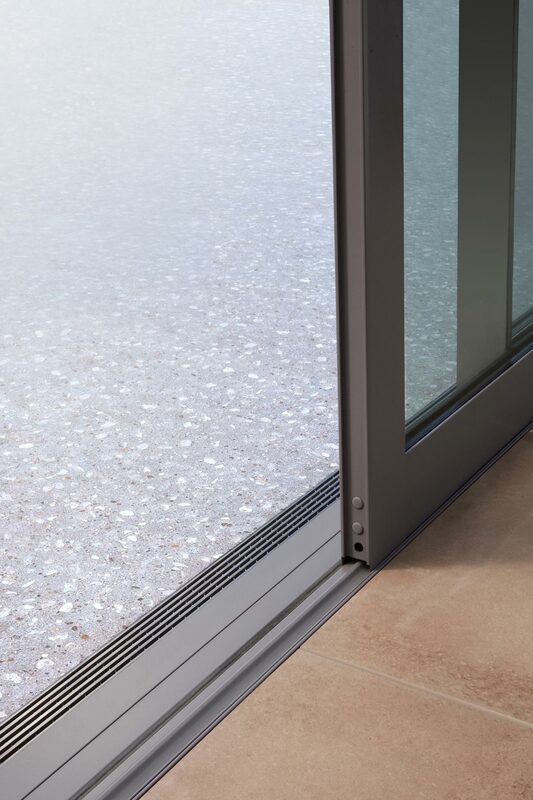 Planitherm is a high performance, thermally insulating glass, also known as low-E glass. It has a transparent metallic coating on one side of the inner pane of a double glazed unit. It’s this coating that reflects the heat generated inside your house back into the room instead of it escaping outside. To illustrate it’s efficiency, we experimented with a showroom display where two types of glass were set up over the top of identical light bulbs. One was Planitherm and one wasn’t. We placed our hands on top of the glass and the difference was immediately obvious. The Planitherm glass was cold, while the other one was particularly warm, indicating significant heat loss. After feeling that first hand, our decision was a no brainer. 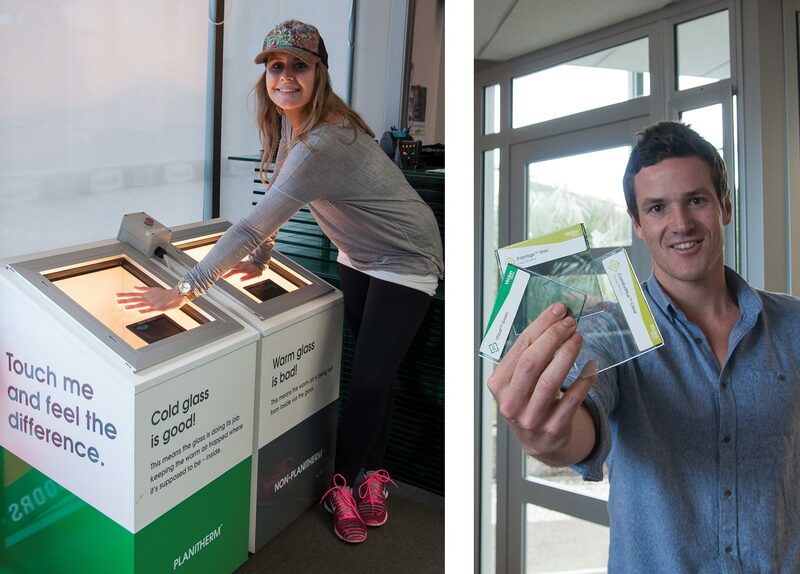 Kylie checking out the amazing Planitherm technology first hand while Ben poses with some of the many tint options available. 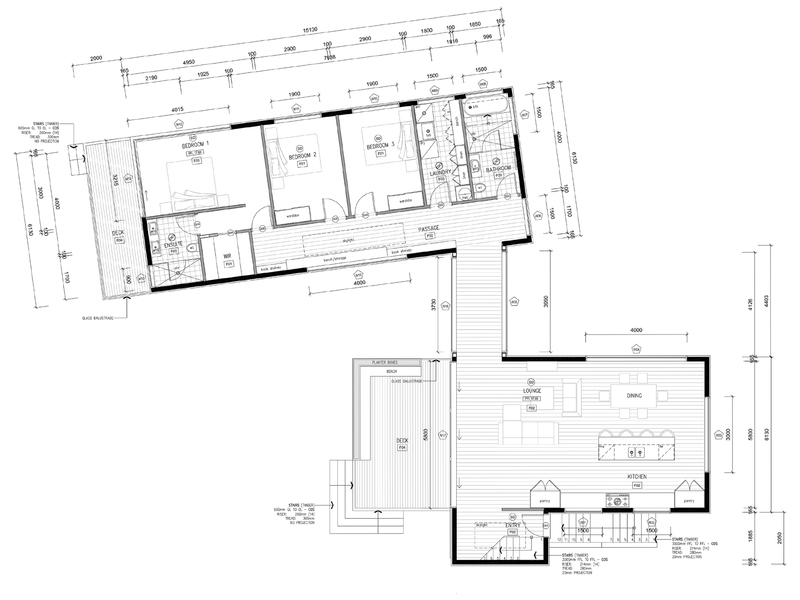 As you can see on our floor plan, we have some huge windows and doors. We’ve described the biggest ones above, but every room has large expanses of glass. The biggest single piece being 4015 x 2440. We’ll keep updating this page and our build diary as we check in with Fletchers during the manufacture of these beautiful objects. Then as they begin to get installed in the house. Eeek, we can’t wait! A wall cavity Eurostacker and Ben trying some of the door options out in the showroom.